Looks Who’s on the New York Times Best-Seller Lists! Well, this is just a banner week for Writers’ League members appearing on the Jan. 31 New York Times best-se ller list. 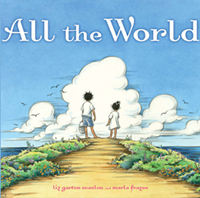 Liz Garton Scanlon sits at #2 on the Picturebooks list with her Caldecott Honor book, All the World. Jacqueline Kelly’s Newbery Honor book, The Evolution of Calpurnia Tate, is at #10 on the Chapter Books list. And fellow Texan Rick Riordan is also riding high with Percy Jackson & the Olympians topping the Series list. Oh yeah, and there’s that Lighting Thief movie to look forward on Feb. 12! A little bird (thanks Elaine!) told me that WLT member Kathi Appelt is a National Book Award Finalist! Wowza! Did I mention it was her debut novel? The Texas Book Festival schedule is up here. Don’t forget to come visit us in booth # 123.